And of course there's a stoy behind this one, too. Actually, this (now that I'm thinking about it) was my original idea for a Halloween birthday cake for some coworkers, but then after I came up with the idea, someone affiliated with our company drowned while attending our company's annual convention, which, that year, was maybe in Mexico or somewhere - some place on a beach, anyway. It was awful. Horrible. And making a cake in the shape of a coffin was suddenly not a very tasteful idea. So that was when I came up with the Spider Cake idea. I'd already made the coffin lid out of gingerbread, though, and I'd bought the other decorations for it, so I made it up and gave it to the son of a friend of mine, whose birthday was right around Halloween somewhere. He was turning 10, if I remember correctly, so something creepy and gross was perfect for him. The cake was a 13 x 9 cake. The cake mix was for a white cake - I'd mixed in a lot of food coloring to make it red. Bwa ha ha ha. Anyway. I covered the cake (cut in the same shape as the coffin lid) in chocolate frosting. I had painted the coffin lid with brown royal icing and my cake notes (yes, I have index cards with the cake pictures) say "woodgrain w/royal icing." I am not sure if that means I used some kind of comb or something to create a woodgrain directly in the icing, or if I'd painted the woodgrain pattern on with another shade of brown. And when I look at the picture, either or both of those ideas could have been used. I don't remember. To assemble it, I placed the cake in a shallow, disposable aluminum foil pan. 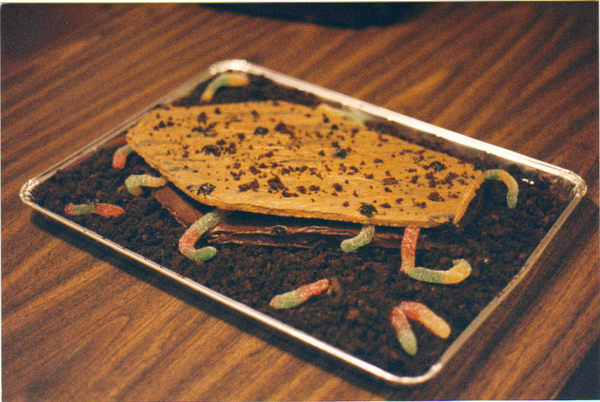 I had a few gummy worms crawling out of the coffin - they helped prop up the coffin lid nicely. I surrounded the cake with crumbled chocolate cake "dirt," and added more gummy worms and some little black plastic house flies here and there.